Boom time is here for railway towns, little places that dot the route of the RM55bil East Coast Rail Link from Port Klang to Kota Baru. Not only will the link shorten travel time between the west and the underdeveloped east of the peninsula, it will also unlock huge economic potential, create thousands of jobs and bring down the country's carbon footprint. And it could all happen sooner than expected. 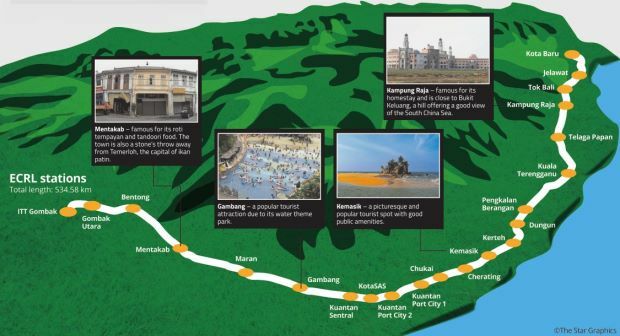 KUANTAN: Exciting days are ahead for the many small towns that dot the route of the East Coast Rail Link (ECRL) from Port Klang to the Kota Baru. A host of towns including Bentong, Mentakab, Maran, Kuantan, Cherating, Chukai, Dungun, Kuala Terengganu and Tok Bali and Kota Baru, all of which are designated as ECRL stations, are looking at boom times ahead. The ECRL will also benefit freight transport as it will link key economic and industrial areas within the East Coast Economic Region such as the Malaysia-China Kuantan Industrial Park, Gambang Halal Park, Kertih Biopolymer Park and Tok Bali Integrated Fisheries Park to both Kuantan Port and Port Klang. Prime Minister Datuk Seri Najib Tun Razak called it “another milestone in the country’s land public transport history”. With its slogan of “Connecting Lives, Accelerating Growth”, Najib said the project sets the tone for an economic spin-off effect and positive social impact for the east coast states. “The ECRL is a high impact project that will provide easy access from the Klang Valley to Pahang, Terengganu and Kelan­tan. “The 688km rail link will be a catalyst for economic equality between the west coast and east coast as it will stimulate investments, spur commercial activity, create ample jobs, facilitate quality education and boost tourism in the states of Pahang, Terengganu and Kelantan,” he said at the ground-breaking ceremony here yesterday. Najib also urged local contractors with capabilities and know-how to seize the opportunity to take part in the project. “We have together with our Chinese counterpart agreed that Malaysian contractors will be involved in at least 30% of this high impact project,” Najib said. “The viability of the ECRL is undisputed as it is estimated that 5.4 million passengers and 53 million tonnes of cargo will use the service annually by the year 2030 as the primary transport between the east coast and west coast. Najib said the project was long overdue as the east coast states of the peninsula had only been connected to the west coast via a network of roads, highways and woefully inadequate rail lines. Najib also urged local contractors with capabilities and know-how to seize the opportunity to take part in the project. “We have together with our Chinese counterpart agreed that Malaysian contractors will be involved in at least 30% of this high impact project,” Najib said. The railway line, with 12 passenger-only stations, three freight stations and seven combined passenger-freight stations, is expected to increase the gross domestic product of the east coast states by 1.5%. China’s state-owned China Communications Construction Company has been appointed for the construction of the RM55bil project. Malaysia Rail Link Sdn Bhd is the special purpose vehicle under the Minister of Finance Incorporated tasked as the project owner. KUANTAN: The economic impact of the East Coast Rail Link (ECRL) is huge and critics who say it is not feasible are wrong. “There will be a multiplier effect. When there are more business people, we can get more taxes and government revenue will increase,” Malaysia Rail Link (MRL) chairman Tan Sri Dr Mohd Irwan Serigar Abdullah said. He said critics must also look at the development that would take place alongside the ECRL in the long run. China Communications Construction Group chairman Liu Qitao said the ECRL project was of great economic significance. “It will promote social development and improve the living standards of those along the railway line, especially in the east coast,” he said. Liu said that the rail link was also expected to generate more than 80,000 jobs for Malay­sians during its construction period. Another 6,000 jobs will be created during the rail’s operation and the Chinese government will also train more than 3,000 Malaysian students. A total of 3,600 graduates will be trained in rail technology through the ECRL Industrial Skills Training (PLKI-ECRL) programme. Its chief coordinator Prof Dr Rizalman Mamat said about 1,000 applications had already been received as of yesterday. “The first intake of 50 participants will begin in September with the next intake of 250 scheduled in December. The next batch of 700 trainees will be in April next year. “The programme will be focused specifically on the socio-economic development of the east coast but this does not mean those in the west coast cannot take part. Dr Rizalman said the training was open to graduates who majored in civil engineering, mechanical engineering and electrical engineering. He added that Universiti Malaysia Pahang (UMP) had been appointed as the focal university for the implementation of the programme, with cooperation from Beijing Jiaotong University and Southwest Jiaotong University and other institutions of higher learning in Malaysia. He said railway technology was developing rapidly and the programme was a stepping stone for UMP to develop rail engineering in the future. The training under the programme will take four to six months, said Dr Rizalman. China state councillor Wang Yong said ECRL was a landmark project for China and Malaysia. “The team from our two sides have had productive cooperation. This is a full demonstration of the friendship between China and Malaysia and its efficiency,” said Wang. MRL project director Yew Yow Boo said the railway would have 88.8km of viaducts mostly in Kelantan and Terengganu to bypass flood-prone areas. 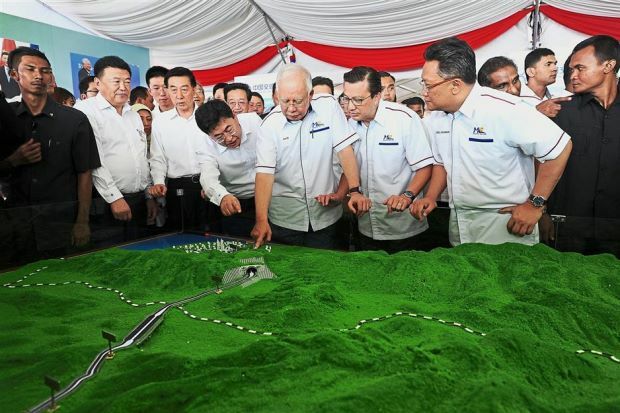 Yew said the first phase would have a total length of 49km of tunnels at 19 locations with the longest being 17.9km connecting Bukit Tinggi and Gombak. KAJANG: The East Coast Rail Link (ECRL) is created for the people and country, and should not be politicised or turned into a racial or language issue, says Transport Minister Datuk Seri Liow Tiong Lai. “I would like to emphasise that the ECRL is one of the most important projects for the nation. “It’s a game changer for the east coast. 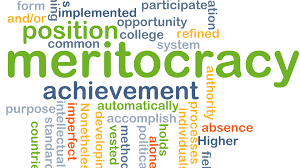 It is for the country’s economic development and to help us reach greater heights. “The theme is very clear, we’re pushing for connecting lines and accelerating growth,” he said after attending Universiti Tunku Abdul Rahman’s 15th anniversary celebration at its Sungai Long campus here yesterday. The RM55bil ECRL from Port Klang to Kota Baru, which is 534.58km long, is estimated to be completed in 2024. Liow cautioned actions that could harm good bilateral ties between Malaysia and China were counter-productive. 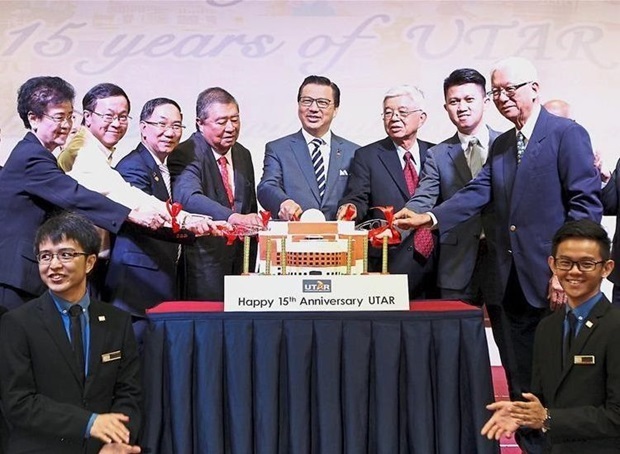 Varsity pillars: (Standing from left to right) Utar founding president Tan Sri Dr Ng Lay Swee, MCA vice president Datuk Dr Hou Kok Chung, Dr Chuah, Dr Ling, Liow, Dr Ting, Chong and Utar Board of Trustees chairman Tan Sri Dr Sak Cheng Lum cutting Utar’s anniversary cake. “We must explain to the people that the ECRL is for them and the nation. They should not be misled by those out to create a controversy,” he said. The ECRL was launched in Kuantan on Wednesday. Certain groups had criticised the rail link launch, claiming that it was “too Chinese”. Liow described the launch as a successful event, adding that the project was set to bring many benefits to Malaysians. “We have received a lot of support for the project. We are looking forward to its completion,” he added.